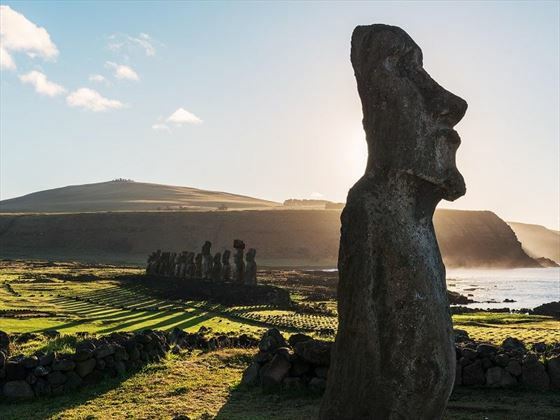 Located 3,700km away from Chile’s mainland, Easter Island, natively known as ‘Rapa Nui’, is a remote speck in the Chilean Pacific, while it may be hard to get to it is definitely worth the effort. With almost 900 human carved stone figures weighing an average of 125kg and standing at a height of 13 feet, the stories behind the considerable efforts of these monuments remains a mystery to this day. 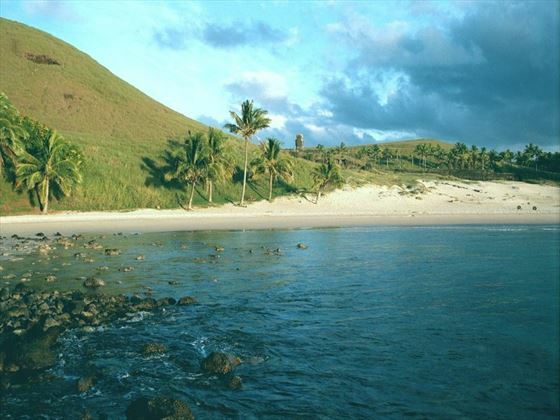 Explore these intriguing, logic-defying archaeological wonders and listen to the legends that surround them on guided tours which will take you to Akahanga temple ruins, the ancient ceremonial site of Ahu Akivi and to the edge of a volcano crater, admiring fresh water lagoon views and enormous craters. Spending an afternoon on the gorgeously unspoiled white sands of Anakena beach with calming waves and a warm turquoise sea year round, there is plenty for you to admire. By evening return to your hotel of choice and relax by the pool before indulging in a dinner at the hotel or wander into the local harbour town of Hanga Roa to sample the local seafood (TUR). Arrive into Mataveri Airport and transfer over to your hotel of choice for a relaxed afternoon at leisure. Enjoy breakfast at your hotel before beginning a guided trip to the Akahanga temples ruins where the hats of the maoi are the main astonishing feature, to this day they lie where they fell when the platform was destroyed. The next stop is a visit to the volcano of Rano Raraku, where all the maoi on the island were carved out of rock. Climb to the edge of the crater of the volcano to appreciate the small lake inside and maoi scattered anout the inner slopes in various stages of construction. Continue onwards to Ahu Tongariki, here many of the huge maoi were toppled by a large ‘seaquake’ in 1960. Finally the tour ends at Anakena beach with its two beautiful Ahu. Enjoy a dip in the sea before returning to Hanga Roa in the afternoon. After breakfast begin your tour to Vinapu and Rano Kau – the second of the three main volcanoes to erupt about 2.5 million years ago. It stands at a height of 310m with a huge crater of 1.6km in diameter and a fresh water lagoon 11m deep. Next to the volcano is the ancient ceremonial city of Orongo, where the greatest concentration of petroglyphs exist. There are pictures of the Tangata Manu birdman. This afternoon you’ll visit Ahu Akivi, the archaeological centre of the Roihi sector and the first site to be fully restored in the 1960’s. 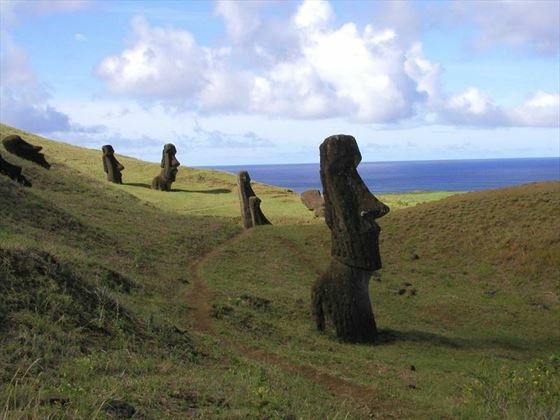 The site is a fascinating ceremonial site not only is the location of interest (in the centre of the island) but also the legends which surround the Seven Moai which are situated on the platform of Ahu. During your tour you will visit Puna Pau, to the east of Hanga Roa, in a small crater of red stone. Here the ‘pukao’ or hats (topknots) which crowned the maoi were made. On the way it is possible to see the path where they were transported, including some examples of the Pukao which have fallen by the wayside. Return to your hotel this evening for your overnight stay. After breakfast, transfer to Mataveri Airport for your onwards flight. If you wish to spend an extra night here – the snorkelling, diving and surfing are highly recommended or experiencing the savage beauty here by foot, bike or horseback. Easter Island is composed by archaeological and cultural sites which are under conservation protection. Access is forbidden to restricted areas. 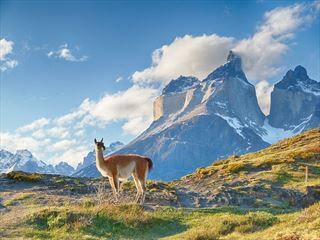 Beginning in Punta Arenas – the closest city to the tip of Chile’s southernmost Patagonia region, this 4-day adventure takes you sailing through the Ultima Esperanza Fjord, hiking through striking native forests, witnessing towering glaciers and exploring the breathtaking world heritage UNESCO National Park of Torres del Paine. 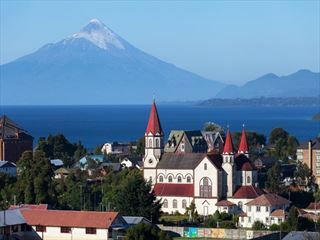 Begin in the quaint port city of Puerto Montt in Chile’s Lake District where you'll explore and sample the local seafood before continuing to the colonial town of Puerto Varas, on the enormous Lake Llanquihue with picturesque snow-topped Volcanoes acting as a dramatic backdrop, both still active. Take a trip to the Vicente Perez Rosales National Park, admiring the Petrohue Falls and enjoy a catamaran cruise through a tiny hamlet before visiting the beautiful town Chiloe Island. 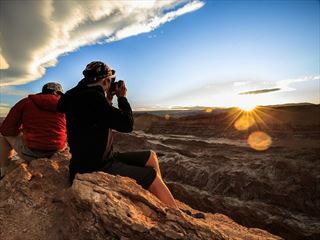 Spend 3 nights in San Pedro de Atacama exploring the world’s driest desert, staying in the Andes Mountain range with day visits to the spectacular scenery, once under the sea before the millions of years of evolution formed the Andes emerging from the seabed leaving beautiful flora and fauna to explore as well as many picturesque volcanoes surrounding you.